Recently guests at Rhino River Lodge have been getting up close and personal with a very special rhino that often approaches vehicles and rubs them with her horn in search of food. “Lucky” is her name, she is one of the rare survivors of a poaching attempt, and this is her story. On 8th February we took a drive through the Zululand Rhino Reserve. The sweltering Zululand heat added further weight to the heavy burden that we were already carrying on our shoulders. The day before, a male white rhino had been found poached on our property and we were devastated. The idea was to drive through the reserve to clear our heads and to try to heal our hearts. So began our search for the calf’s mother. Thankfully the calf itself was old enough to survive on its own, and it joined up with other rhinos. The first step, therefore, was to try to account for all of the females that we knew frequented the area. We were able to confirm that an adult female was indeed missing as all the rhinos are identified by notch patterns in their ears. We searched, the anti-poaching patrols searched, and all the rangers searched. But for two weeks we couldn’t find anything. We were thankful and relieved that we hadn’t turned up a carcass, but worryingly we just couldn’t find the missing rhino. Then came the call on the radio – a white rhino female had been located. She had been hiding in a thick cluster of bushes, was visibly injured, and her condition was poor. The vet was called and she was darted and treated. She had been shot in the head and the bullet had lodged next to her spine. Due to the bullet’s location, the vet was unable to remove it. A radio tracker was fitted to her ankle so we could relocate her, and she was darted and treated again a couple of weeks later. We affectionately dubbed her “Lucky” for surviving such a traumatic experience. The injury has caused half of her face, including her ear, to droop. She appears to be blind in that eye and possibly deaf in that ear. Half of her mouth hangs down, making grazing and eating difficult. Then winter set in, and with it this year, a drought. As the quality of the graze diminished, so did her condition. The vet determined that darting her again for treatment would be too risky so now our only choice is to supplement her with food and treat her as best we can without having to anaesthetise her. Every day now, come rain or shine, we attempt to find and feed her to get her through the long winter. Her condition fluctuates, as in her weakened state she is prone to injuries and doesn’t heal well from them. She is fighting tenaciously for her survival. We are doing all we can to support her in that fight. 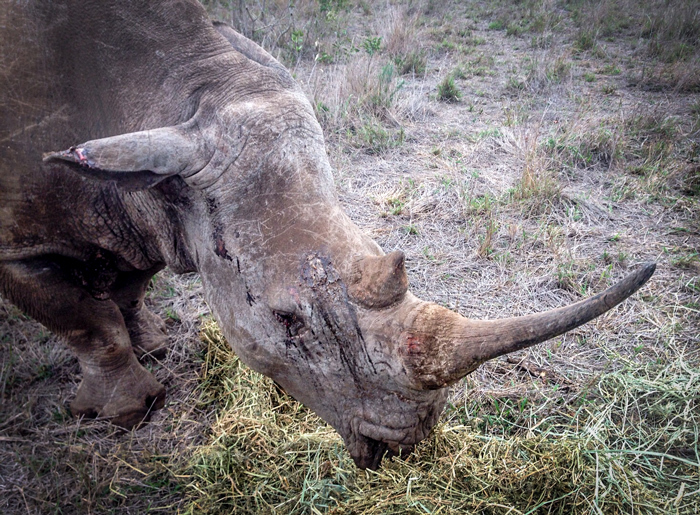 We realise that Lucky is an ironic name for a rhino that has been shot in the head. But she is lucky, because she is one of the survivors when too many of her kind have died at the hands of poachers. 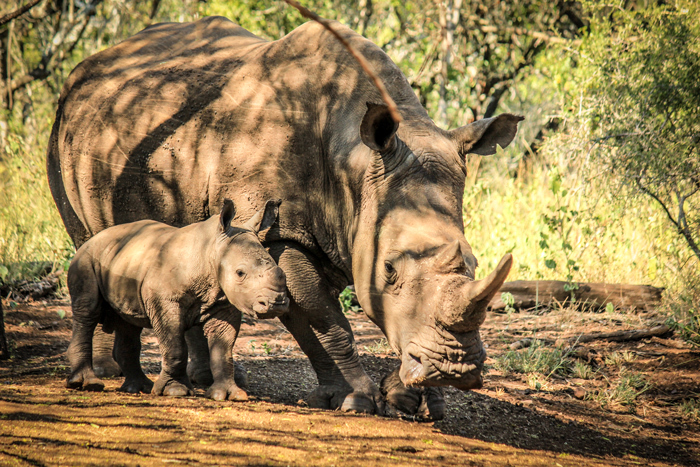 Lucky’s calf has settled in nicely with the other rhinos that she joined and is frequently spotted with them. She is doing very well as a young adult. Lucky and her calf back in 2012. Now she is old enough to be on her own and is doing fine.